Fumble, punt, fumble, interception, fumble. That's how the New England Patriots started their exhibition game against the Detroit Lions. Fumble, punt, fumble, interception, fumble. That’s how the New England Patriots started their exhibition game against the Detroit Lions. The Patriots moved the ball well on the opening drive before tight end Zach Sudfeld — who is expected to play a key role in replacing the imprisoned Aaron Hernandez — fumbled at the Lions’ 10 yard-line. 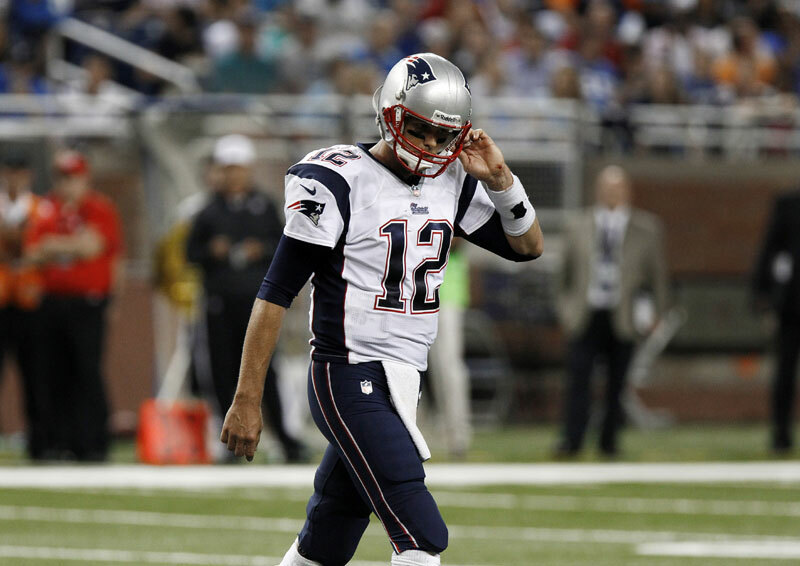 Detroit drove to the New England 5 yard-line before kicking a field goal to take a 3-0 lead. The Patriots went three-and-out on their next possession and then got the ball back on a punt at their own 13. A penalty pushed them back and they were at the original line of scrimmage when Brandon Bolden coughed up the ball. The Lions couldn’t move the ball before missing a 31-yard field goal. But it wouldn’t be long before New England would turn the ball over again. On the fifth play, Brady threw the ball into coverage and it was picked off by Chris Houston. Four plays later, Matt Stafford hit Tony Scheffler on a 9-yard touchdown pass that made it 10-0. After the kickoff, the Patriots managed just two plays before Shane Vereen fumbled on his own 6 yard-line. Four plays later, it was 13-0. The turnovers didn’t just cost the Patriots a meaningless game; it may have kept them from working on what they needed to see in the penultimate exhibition game: According to ESPN.com, Vereen and Bolden never got back on the field. The Patriots, who won their first two exhibition games, will play the New York Giants at home next Thursday in their final tuneup, then open the season against the Buffalo Bills on Sept. 8. “We had a couple of good weeks against Tampa and Philly. We had some good practices and then we have a week like this, when you figure out we aren’t anywhere near where we need to be,” Brady said. “If we are going to kick off in two weeks, we are going to have to play a lot better than this. That’s a good lesson for all of us. I don’t care who you are. It’s the NFL. It’s a very humbling game.